It may come as a surprise to all of you but I actually do have a boyfriend and I live with him. This means a few things but mostly that I make dinner for two and generally try to make some good man food, you know? Enter this chili. It is delicious and uncomplicated. It is a serious crowd pleaser and is great for entertaining. You can even have a freaking chili party where everyone can “build their own bowl” with their favorite add-ons. How easy is that? This version is conveniently paleo. However, if you are really into beans you can add them. If you hate beef you can add turkey. If you’re feeling adventurous, you could add a pound of sausage. 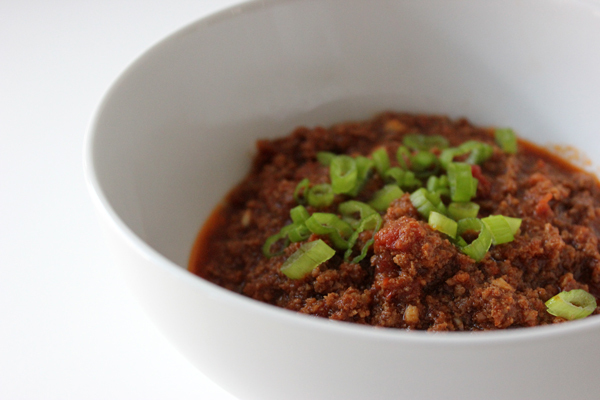 Basically what I’m saying is that this here chili is really, really adaptable. You’re welcome. Fry the bacon in a dutch oven or stock pot until browned. I do not pour off the oil since I spend a small fortune on our bacon but if you would like to, pour off all but 2 tablespoons of oil. Add onions, bell pepper, garlic, chili powder, cumin, coriander, pepper flakes, oregano, and cayenne. Cook stirring occasionally until veggies are softened and begin to brown. Increase heat to med-high and add half of beef. Cook, breaking up with a spoon until brown, about 3 to 4 minutes. Add the rest of the beef and repeat. Add the tomato and tomato puree. Bring to a boil and reduce to a simmer. Cover and stir occasionally for 1 hour. Remove lid and simmer 1 hour longer. Stir occasionally. Adjust seasoning with salt to taste. This is my kind of recipe! I’m not a fan of beans (any kind!) which means I’m usually passing on a yummy bowl of chili. Can’t wait to try this recipe! OMG, yum! Mental note: Get thee to the grocery store. Yummy this looks delicious! I am starving looking at this. I hate beans haha so this is perfect. You’re gonna think I’m crazy but I’ve never tried chili….because of the bean factor. Think this could go in a crockpot? oh yum yum! love that this is paleo also! Currently eating chili, but this chili looks damn good. hmmmm….that looks pretty delicious! I love a chili with a lot of seasoning! 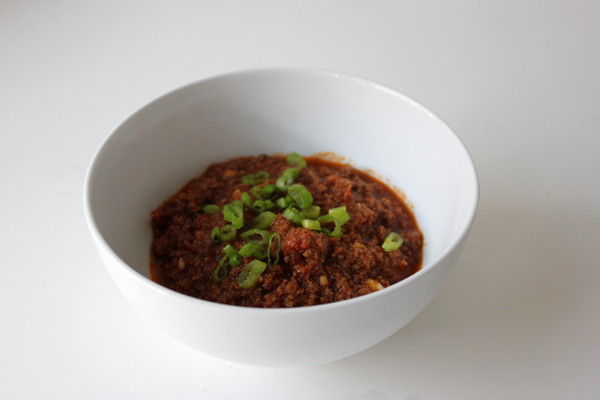 I’ve never included bacon in chili- sounds good! I looveeeee chili–turkey or beef–but I’ve never thought to add bacon. UM YUM! I need to make (and then down) a bowl of this ASAP.